So you’re coming to the end of the academic year, come summer you’ll be free to conquer the world, live life to the full and embark on that most enigmatic of dreams – travelling. But ‘travelling’ is a big word. Not because it has three syllables, because the world’s a big place and there are thousands of places you could go, things you could do - and mistakes you could make. Your only limits are your budget, how much time you have and your own imagination, but you can give yourself a great head start by planning ahead. There’s no substitute for good planning. You should devote as much time and energy to it as you can before you leave. Use the internet to research your destination, decide what you want to get out of your trip and figure out what you’ll need in order to do so, and if you can, talk to people who’ve been there, as first hand knowledge is invaluable. But being prepared isn’t just about where you’re going, it’s also about you. Make sure you’re in good health and mentally prepared for the challenges that may await you. What is There to Think About? Passport – check. Toothbrush – check. Socks – check. Anything else? Well, if you’re planning on travelling for the first time, there’s a whole host of things that won’t even occur to you. But don’t worry, even if you’re an experienced traveller, you always find there’s something you didn’t plan for, in fact, that’s part of the whole adventure. The best way to ensure you’re well prepared is sheer saturation of ideas. The more time you spend thinking about each aspect of your trip the more ideas you’ll come up with and the more you’ll be psychologically prepared for it. Make a list of everything you think of and carry it around with you, adding to it whenever you think of something new. Categorise it and make a plan as to how and when you’re going to address each issue. Travel Documentation – what you need, how to get it and how long it takes. Go to the embassy website of the country or countries you plan to visit, here you’ll find the most authoritative list of legal requirements. Also, check the expiry date on your passport. 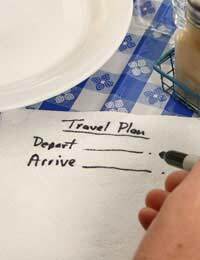 Travel tickets are usually cheaper when bought in advance, although this can cause you to be constrained by your itinerary. Health – check out the Department of Health advice page for travellers, which includes information about medical cover around the world. Research the health risks in the regions your planning to go to. Access to funds – make sure you know how you’re going to access money when you need it. ATM cards work in most countries but not in all. Make sure you have a Plan B and a Plan C for getting cash when you need it. Basic Information – You need to have some modicum of an understanding of the place where you’re going – customs, laws, dangers, politics, the currency. A short time spent online can give you the basics, after that it’s up to you. You’ll find in time, that half the things you did to prepare weren’t necessary, but that’s ok – just put it down to experience. You may also find that your plans were more of a hindrance than a help, that constraining yourself to them meant you missed out on certain opportunities. The real beauty of planning ahead is that you won’t feel stressed when you set off – you’ll have an idea mapped out in your head of what’s going to happen and the comfort of knowing that you’re ready. However, don’t be afraid to spontaneously change your plans while you’re away – remember it’s all about adventure!